What happens when you: 1) make a great batch of something, eat it, and love it; 2) eat it for leftovers, and love it; 3) eat it for leftovers again, and kind of loved it more the first or second time you ate it; 4) can’t stand to look at it in the refrigerator anymore? I know. Even with my favorite foods, there comes a limit to my tolerance to it after consecutive encores. That’s where the brazen versatility of leftovers comes into play. 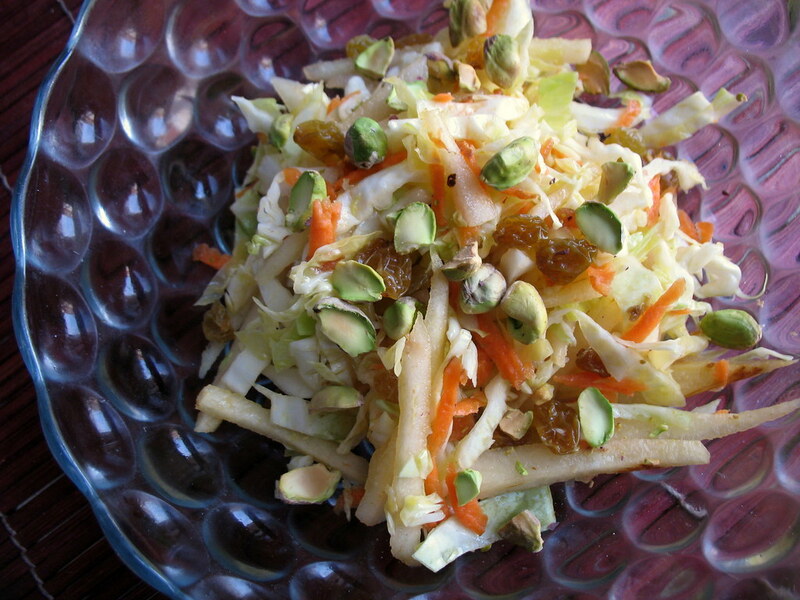 In the case of this raw, slaw-like salad, it knows no cultural boundaries, either. It’s unseasonably warm in New York today. I’d had a case of winter vegetable fatigue earlier this week; talking with my friend about eating squash, he gave me the hand and said, “I’m so sick of squash I can’t listen.” I, too, had become sick of what’s in season: cabbage, apples, carrots and parsnips… Instead, today I felt like nibbling a fresh, summer salad. But wait! It may not be leafy green season yet, but shredded cabbage makes a fine, crunchy salad base. And despite the limited options at the Greenmarket, I’d picked up a bag of twelve slightly bruised apples and pears. I was delighted to find a mix of apples and pears (this was from Locust Grove Farms, at the Union Square Greenmarket, the bag only $2) and have been crunching on them as snacks throughout the week. Those pears were a steal; though their skins looked dull and browned, a quick shave revealed crisp, snow-white, juicy flesh. So a pear and cabbage salad was to be my salvation. I really didn’t think I would enjoy this simple salad as much as I did. But the pistachios and golden raisins really made it. Dressed in just a splash of red wine vinegar and olive oil, all those textures and sweet flavors, punched with the salted pistachios, duly satisfied my salad itch. But instead of putting away the leftovers as is, I thought I’d set myself up for some variety the next day. 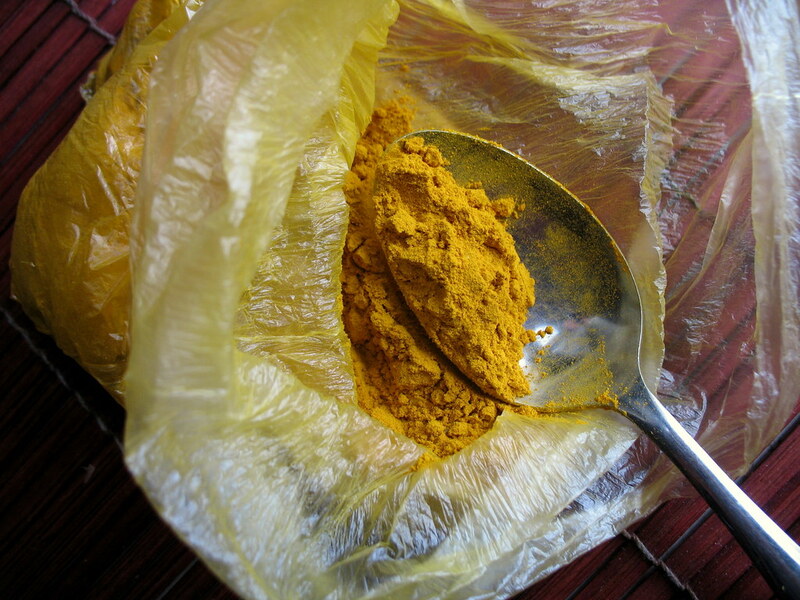 Something about the taste of golden raisins reminded me sweet-and-spicy chutneys, so I quickly softened up an onion in a sautee pan, dyed it yellow with turmeric and other spices, and cooked down a cupful of my once-salad (without the pistachios) with it. To thicken the juices, I added a small scoop of apricot preserves. In the recipe below, the option of tomato paste instead of this will do the thickening trick, too, while turning the chutney to a slightly more savory category. Choose your own adventure. 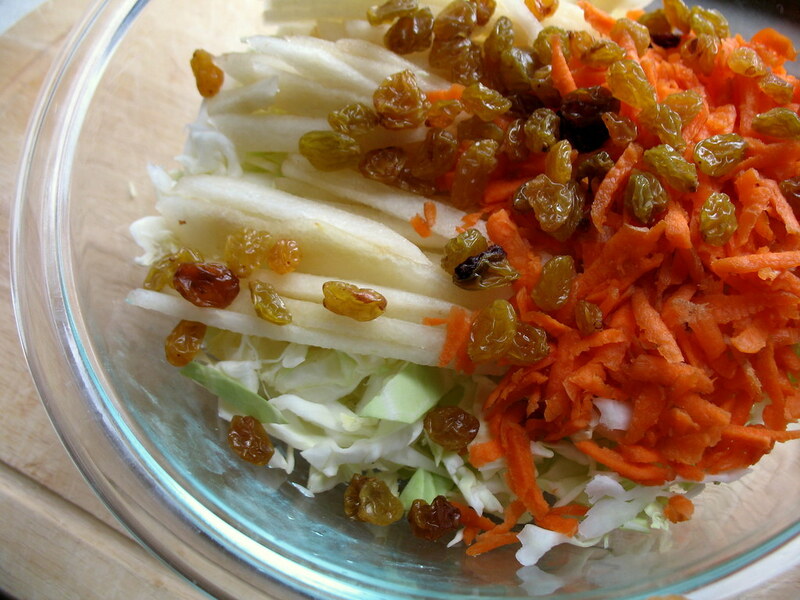 Combine the cabbage, carrot, pear and golden raisins in a bowl and toss. Dissolve the sugar in the red wine vinegar in a small bowl and drizzle on top of the salad. Drizzle the olive oil and toss thoroughly. (Can be covered and chilled for up to two days before serving.) 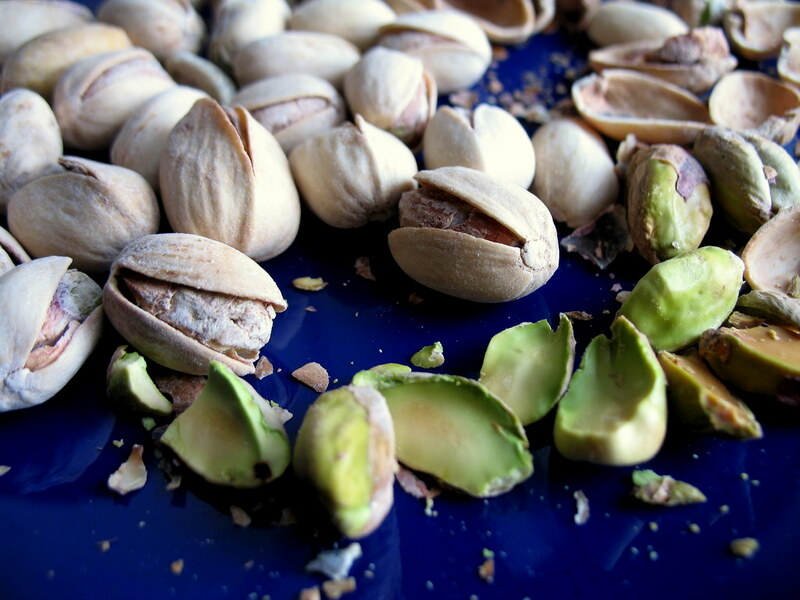 Plate the salad and sprinkle the pistachios on top. Heat the oil in a saucepan or heavy-bottomed skillet with a cover and soften the onions over medium heat for about 5 minutes, stirring. Season with salt, pepper and all the spices. Add the apricot preserves or tomato paste, garlic and the leftover salad. Cook, stirring, about 2 minutes or until pears and cabbage begin to wilt a bit more. Break up larger pieces of the pears with the side of your spatula. Add about 1 1/2 cups of water, reduce to a simmer and cover. After about 20 minutes, remove cover and stir. Add more water if mixture is becoming too dry. Cover and simmer another 15-20 minutes. 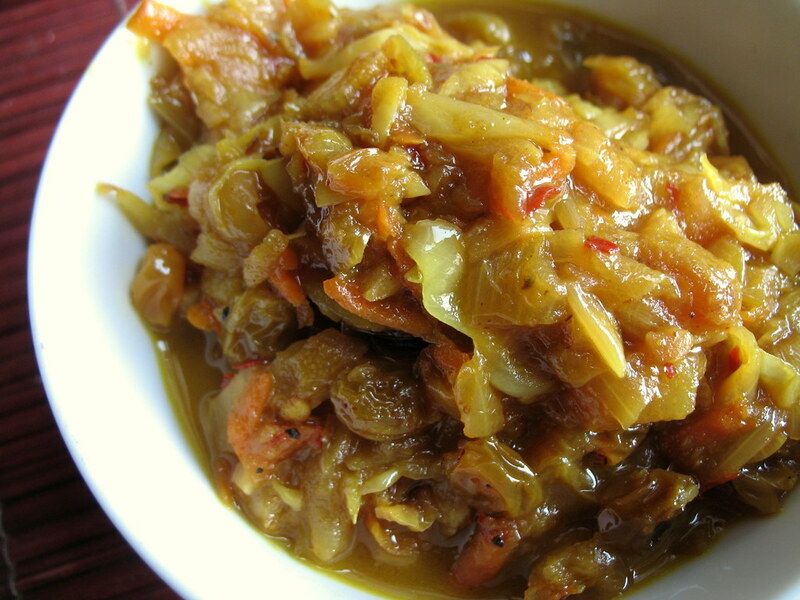 Taste chutney for seasoning, adding extra salt or spices as desired. Serve with flatbread, Indian daal, pitas, regular bread, crostini, rice or whatever cooked grains you please. 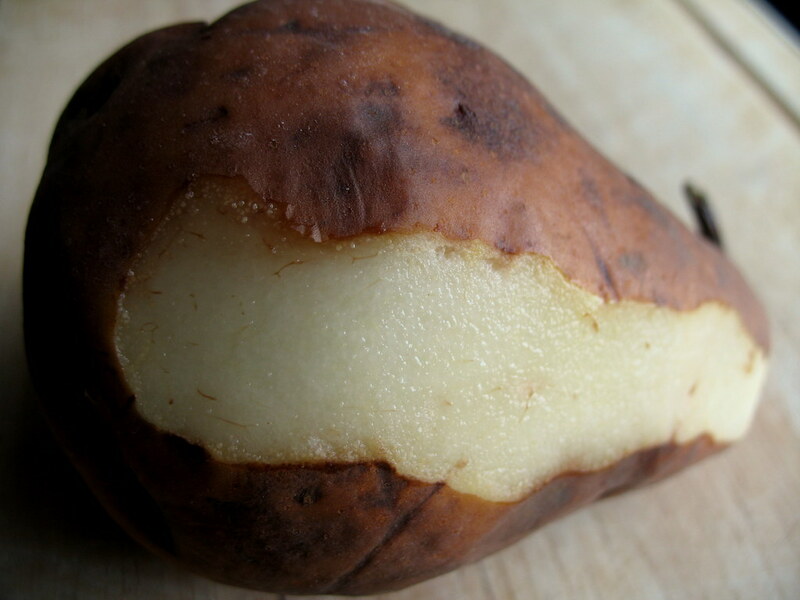 Three brownie points: Speaking for both dishes, this is a very healthy side dish. Pale green cabbage is unexpectedly nutritious, with Fiber, Vitamin K, even calcium and iron. It also practically disintegrates into neutral slivers of silkiness when cooked into the chutney. What a good way to hide a healthy veggie, in a sweet condiment. Seven maple leaves: This recipe use mostly seasonal ingredients, with some dried fruit and nuts. If I’d made more of it to go around, I might consider freezing that chutney for a rainy day. Canning, jamming is a traditional budget-savvy and earth-happy way to use up leftover or not-so-fresh produce, and when you keep your freezer filled to the bursting with containers of frozen stuff, it helps the unit run on less energy. Nice way to spice up left overs by adding something new! Same concept as pudding, but I never really thought about that! I just noticed though that your three brownie points had four at the top. The visuals must be displaying the real score. I’ll be looking back frequently to check out other ideas!